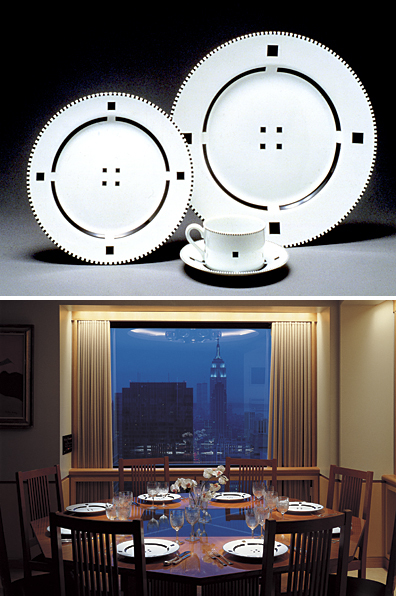 Gwathmey Siegel Kaufman’s popular “Tuxedo” pattern plates, designed for Swid Powell, will be displayed in a special exhibition, “The Architect’s Table: Swid Powell and Postmodern Design,” from September 25, 2007-January 6, 2008 at the Yale University Art Gallery. Swid Powell, founded in 1982 by Nan Swid and Addie Powell, produced original houswares designed by renowned architects including Gwathmey Siegel Kaufman, Frank Gehry, Zaha Hadid, Stephen Holl, Richard Meier, Robert A.M. Stern, Stanley Tigerman and Robert Venturi. The exhibition honors Swid Powell by featuring selections from their collection of more than 1,200 prototypes, realized products, sketches and design drawings.